Data from the Alzheimers Disease Association estimates that approximately 5.4 million Americans are living with Alzheimer’s disease today at an estimated annual cost of $183 billion dollars. Of Americans aged 65 and older, 1 in 8 has Alzheimers disease and nearly half of people aged 85 and older have the disease. Most people survive an average of 4 to 8 years after diagnosis. These sobering facts don’t begin to address the emotional and economic toll on families. Are forgetful episodes a natural consequence of aging or do they indicate something far more serious? The answer involves a two part process; to establish the diagnosis of dementia and to elucidate the various causes. alcoholic or hepatic encephalopathy, tumor, trauma, demyelination and treatment effects of radiation or chemotherapy. An FDG-PET scan is then considered reasonable and necessary if a diagnosis of Alzheimers disease remains uncertain in the judgment of a physician experienced in the diagnosis and assessment of dementia. In the recent past, radiologists served only in providing a supportive role of excluding the gross structural abnormalities discussed above. The diagnoses of dementia and neurodegenerative processes relied on histories provided by family members or well acquainted observers, cognitive scales and neuropsychologic testing, exclusionary laboratory data and negative anatomical CT or MRI studies. 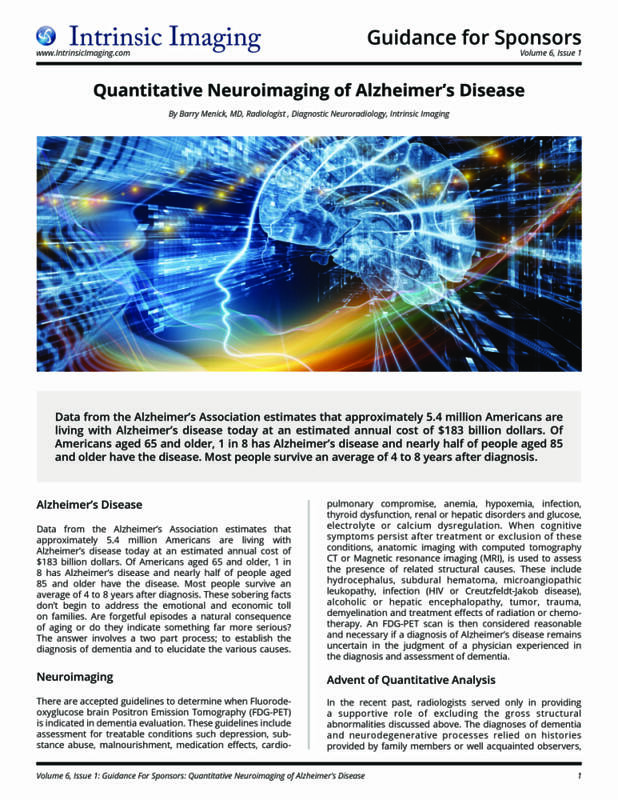 The advent of quantitative analysis has pushed neuroimaging to the forefront of the evaluation of Alzheimer’s disease. The overall accuracy of brain PET is 85% (sensitivity 94% and specificity 73%) compared with a clinical accuracy of 69% (sensitivity 84% and specificity 52.5%). Clinical diagnosis has an evaluation period of at least six months, during which time a patient could have benefited from earlier institution of medical therapy. Prompt treatment with an anti-cholinesterase medication can delay the cognitive decline by 6 to 18 months. A subsequent cost/ benefit analysis using FDG brain PET earlier in the American Academy of Neurology algorithm for Alzheimer’s diagnosis was proposed by Silverman et al from UCLA. New medications and vaccines will require clinical trials to assess neuropsychological response and imaging endpoints to quantitatively assess amyloid plaque burden and distribution as well as objective changes in regional glucose metabolism. 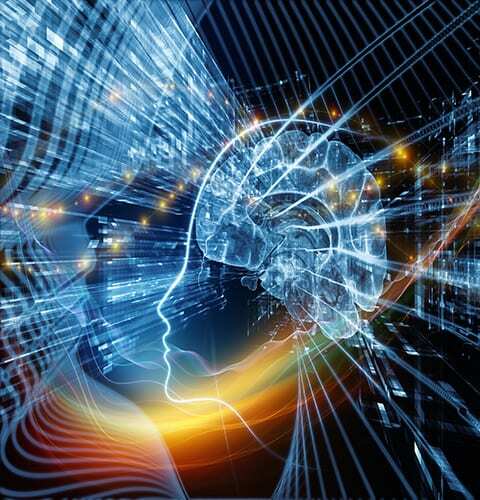 A variety of quantitative anatomical and functional neuroimaging studies have added value to the routine anatomical imaging of the past few decades. Quantitative studies of cerebrospinal fluid (CSF) flow using phase contrast MRI, quantitative volumetry using voxel based morphometry (VBM)-MRI and quantitative F-18 FDG brain PET using a standardized region of interest (SROI) approach are commercially available using Food and Drug Administration (FDA) approved software on basic imaging platforms. Quantitative CSF flow MRI studies offer a non-invasive method for determining shunt-responsive normal pressure hydrocephalus (NPH). The classic clinical triad of the syndrome includes dementia, ataxia and urinary incontinence in varying relative severity. The initial imaging evaluation for NPH is the subjective analysis of ventricular enlargement out of proportion to sulcal prominence, an example of the art of image interpretation. Patients in the typical age range for NPH have a problematic normal degree of ventriculomegaly and sulcal prominence. In the appropriate clinical setting, when this observation is considered, further evaluation with a quantitative CSF flow study can document elevation of aqueductal CSF stroke volume associated with decreased periaqueductal white matter compliance. The method for analysis of CSF flow through the cerebral aqueduct applies a flow sensitive phase contrast MRI sequence using velocity encoding gradients to bracket the range of flow velocities. Vendor specific software uses the area of the cerebral aqueduct and directional velocities of CSF flow through the cerebral aqueduct at time points during the cardiac cycle to determine forward and reverse stroke volumes. There is a threshold above which CSF diversion can have a beneficial effect on the clinical triad, particularly with regards to ataxia. Shunt responsiveness can be further assessed with the quantitative endpoint of reduction in CSF stroke volume in addition to the qualitative assessment of reduction in ventricular size and clinical response. The radiologists of Intrinsic Imaging employ FDA approved VBM-MRI software in the anatomical imaging evaluation of dementia and mild cognitive impairment to enhance the sensitivity and specificity of our routine MRI studies. Since both CT and MRI are used in the Alzheimers diagnosis algorithm to exclude other pathologic processes, the addition of a quantitative assessment of hippocampal volumes establishes a baseline for the patient and compares the patient to an age-matched peer group. No longer do we have to speculate about hippocampal atrophy in a population where there are varying degrees of normal volume loss. This quantitative approach is helpful in identifying patients at risk for progressive cognitive deterioration. In a patient with generalized volume loss, uncertainty whether hippocampal volume loss is disproportionate is reduced by the quantitative analysis. In addition, hippocampal volume can be used as an objective metric over time to follow disease progression or response to therapy. Statistically significant reduction in hippocampal volume is not specific to Alzheimers disease; frontotemporal lobe dementias involve the medial temporal lobes as well. Brain PET, therefore, is a valuable tool in both the documentation of a progressive neurodegenerative process characterized by specific patterns of hypometabolism and in the differentiation of the various types of dementia associated with hippocampal atrophy. Normal hippocampal volumes do not exclude a diagnosis of Alzheimers disease, as both beta-amyloid (AB) deposition and diminished regional cerebral glucose metabolism (rCMRglc) can occur in specific locations prior to the evolution of volume loss and prior to the clinical manifestation of cognitive impairment. The hallmark of Alzheimers diagnosis heretofore has been the histologic demonstration of extracellular plaques containing beta-amyloid and intracellular neurofibrillary tangles containing tau protein. The amyloid hypothesis that deposition in susceptible portions of the neocortex begins the pathologic cascade of neuronal degeneration has fostered the current investigation of PET imaging agents specifically targeting beta-amyloid as well as treatment strategies aimed at preventing its accumulation and deposition. Presently, brain PET imaging uses a glucose analog tagged to radioactive flourine (2-deoxy-2-[18F]fluoro-D-glucose) or FDG. We first make a qualitative assessment of relative cortical uptake in specific anatomical regions associated with neuronal degeneration in the posterior cingulate gyrus, posterolateral temporal lobes and inferior parietal lobes. We then subject the PET data to FDA approved quantitative software that compares glucose metabolism to a proprietary database of standard age-matched peer groups. High resolution PET scanners (spatial resolution between 2-3 mmm) can detect earlier disease associated with amyloid deposition in the medial temporal lobes. The art of interpretation for both the experienced and inexperienced radiologist can be aided by the application of a quantitative standardized region of interest (SROI) approach. The SROI approach takes patient data from anatomically and functionally defined regions, applies the data to a template where an automated comparison is made to normalized controls. This quantitative approach provides a statistical confidence level to qualitative findings and increases sensitivity in the detection of hypometabolic regions relative to normal baseline cortical metabolism. The quantitative assessment can provide objective timeline data for evaluation of the pathologic process and clinical response to therapy. Amyloid PET imaging is part of a new frontier in Alzheimers diagnosis to provide an in vivo substitute for histopathologic diagnosis. There remain areas of concern with this new approach as discussed by Moghbel et al from the Hospital of the University of Pennsylvania in a recent 2011 editorial in the European Journal of Molecular Imaging. Despite the widespread acceptance of the amyloid hypothesis, beta-amyloid deposition occurs in cognitively normal individuals and up to 20 % of patients clinically diagnosed with Alzheimers disease do not have amyloid pathology at autopsy. The high degree of regional uptake of beta-amyloid (AB) in frontal lobes and white matter is contradictory to histopathologic data. In addition, frontal AB deposition does not correlate with dementia severity or cognitive decline. While drugs and vaccines have reduced beta-amyloid uptake in clinical imaging trials, this reduction does not always correlate with stabilization of cognitive decline. The acceptance of amyloid PET imaging will depend on overcoming these discrepancies and achieving accuracy in the range of FDG brain PET. Computer aided detection will be required to solve the low differential uptake (amyloid to background) ratios to PET image contrast in the prodromal stages of Alzheimers disease. The amyloid burden in prodromal Alzheimers disease expressed as an area fraction may be closer to 0.1% compared with 6% in end-stage Alzheimer’s disease. A quantitative approach will undoubtedly be helpful to determine a threshold for beta-amyloid deposition that can differentiate healthy controls from probable Alzheimers disease and mild cognitive impairment (MCI). To make an impact on imaging diagnosis and treatment efficacy, the science of amyloid PET imaging and quantitative interpretation need to be further elucidated by clinical trials as we attempt to add this developing technology to our diagnostic armamentarium. Dr. Menick is a board-certified radiologist at Intrinsic Imaging with fellowship training in Diagnostic Neuroradiology. He received undergraduate and medical degrees from Duke University in Durham, North Carolina. He completed his radiology residency and 2 year Neuroradiology fellowship at the Hospital of the University of Pennsylvania in Philadelphia. Dr. Menick has been a Senior Member of the American Society of Neuroradiology since 1991. A member of the American Society of Functional Neuroradiology, he has special interests in quantitative imaging for neurodegenerative disorders and functional imaging of tumors.